P. G. Woodhouse once said, “Pretty silly it will make him feel, I rather fancy”, when responding to a critic. It is not that rare to find people who have heard of his name but it is definitely rare to find experts on PGW and someone who can indulge you in a discussion. Bala is one such person who devours PGW and has views that always impressed me. When I bought his book, Subbu’s Code and read it within minutes, trust me I was glad that I bought it. The graphics are pretty neat and the story-line is pretty silly which is why we are featuring humor on Talk To Tiger as a part of our author interviews where we catch up with famous authors and their books. Here is what happened. Hello Balu. Welcome to Talk To Tiger. You know most of my questions so tell me about your childhood. I do! I was born in Bangalore in a middle class family. I studied in St. Aloysious School. I was good in studies and active in extra curricular activities especially debates & essay competitions. Cricket was my favourite game though when it came to fielding the ball had to catch my hand. 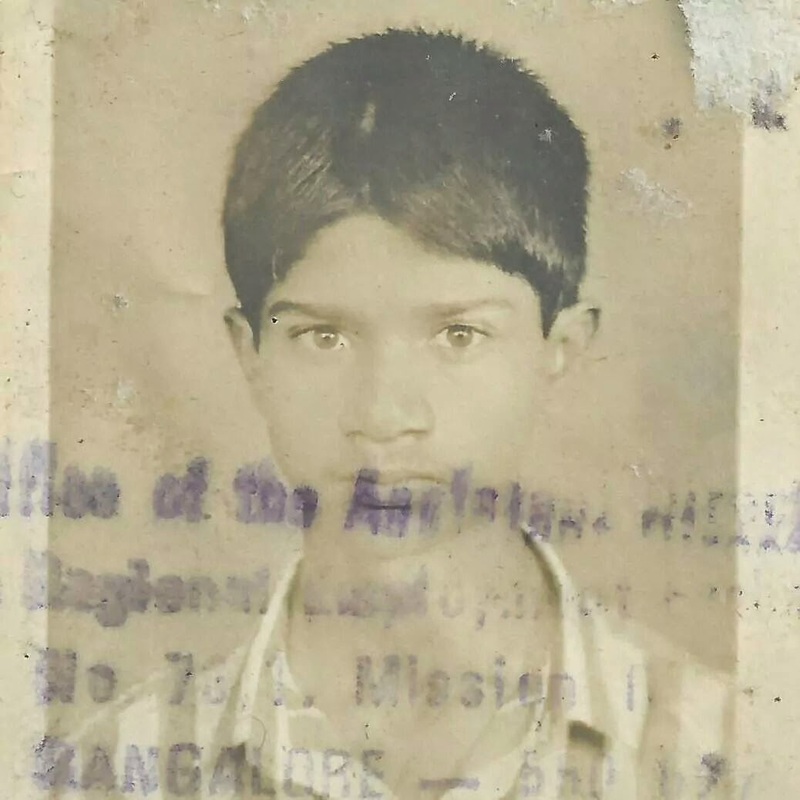 My father was a very strict person and hence childhood was free of any adventures. I did my schooling at St. Aloysious and completed graduation in Commerce at RBANM’s College, both based in Bangalore. I always liked to be creative from a young age having grown up on a fat diet of Amar Chitra Katha and Twinkle comics. I loved writing down quotes from the monthly magazine `Wisdom’ and other books to use in debates, essay, etc. I suffered from depression and on the advice of the psychiatrist started writing a blog. To begin with, it was to express my anger and frustration about society and life. Later I switched to humour to express the same feelings. `Subbu’s Code’ the graphic novel was conceived by me during a writing workshop conducted by Fablery during 2011. I am always against superstition and disgusted at the present state of journalism. Subbu’s Code is just the expression of my disgust about the two. It was somewhere in 2013 that Nethra A , Chief Editor at Fablery convinced me to put this story in words and rest, as they say, is history. The name was arrived at months after the graphic novel was written. The original short story in my blogpage was named as `Superstitious Subbu’. I proposed countless number of names and Nethra finally approved the name `Subbu’s Code’. The graphic novel is not about a super hero but about a common man who fumbles, grumbles and mumbles his way through the maze of life. This is an attempt to bring common man to comics. A humorous take on superstitions, news channels, husband-wife relationship and society – every frame of this comic book keeps you entertained. When a rank stranger who brought the first copy of my graphic novel at Comic Con said it’s great that you people are bringing back humour into comics because of late comics mean superheroes. In fact it is too embarrassing to be shared 😀 The grin says it all. I saw bundles move out of shelves at Comic Con. Based on the response to this graphic novel, I have plans to write atleast half a dozen stories in the Subbu Series making fun of various ills of the society with news channels being the common factor. I one day plan to write a full fledged novel about a con godman. My family consists of me and my wife Kavitha. We are childless but that has not diminished the love between us because it made us realize how important we are to each other. Despite all the jokes on wives, I confess my wife is my biggest strength. Keep doing what you think is best suited for you and one day you will get a recognition for it. I love humour so I stuck to it both while reading and writing it, finally I attained success when `Subbu’s Code’ was published. The impetus is on me to take it further from here. Have some idols in your choosen field like my idol in writing humour is PG Wodehouse. 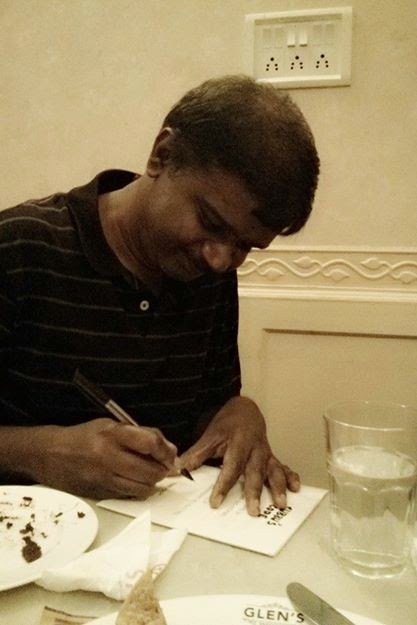 You can reach Balu by mail at balu036@gmail.comand buy the book here: Subbu’s Code. Here is wishing Subbu good luck.